Canada Open: Johnattan Vegas claims second tour victory to claim place in final major. Johnattan Vegas hit a final-round 64 to win the Canadian Open and claim a place at next week's US PGA Championship. Vegas birdied his last three holes to finish 12 under and win by a shot from US Open winner Dustin Johnson, Spain's Jon Rahm and Scotland's Martin Laird. 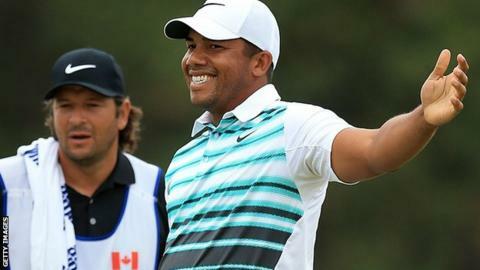 Venezuela's Vegas, 31, had started the final round five shots behind leader Brandt Snedeker. Snedeker finished with a 71 to tie for fifth, while Canadian amateur Jared du Toit also shot a 71 to tie for ninth. Du Toit, 21, was bidding to become the first Canadian to win the event for 62 years and the first amateur to triumph on the PGA Tour in 25 seasons. He birdied the last two holes to secure a top-two finish. America's Steve Wheatcroft would have forced a play-off with Vegas with a birdie at the last but chipped out of a green-side bunker into water to end up with a bogey in a round of 69 to slip to a share of fifth place alongside Snedeker. Defending champion Jason Day closed with a 67 to finish 14th at seven under as the world number-one prepares for the defence of his US PGA title at Springfield, New Jersey.